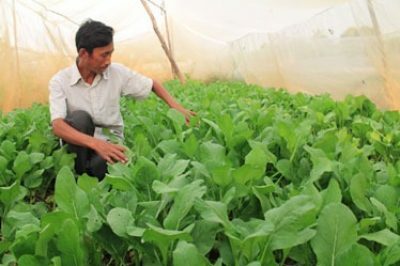 Mr. Nov Keo, 44, resided in Barein Krom village, Svay Proteal commune, Sa Ang district, Kandal province along the Bassac River (a region with intensive production of vegetables), is among a few farmers who produce chemical-free vegetables. Mr. Nov Keo grows vegetables on a plot of 1200 m-2 and supplies year-round vegetables to Natural Agriculture Village Shop in Phnom Penh. He has four nethouses, two supported by a RUA project, one supported by Natural Agriculture Village Shop and one on his own cost. Mr. Nov Keo has grown vegetables since 2001, and he had intensively used pesticide to control pests. In 2013, he was selected by USAID Horticulture Innovation Lab funded project “Rural Investments in Agricultural Technologies (RIAT)” to test low-cost nethouse for safe vegetable production. The results were promising, and thus he got support from the project to install the second nethouse. Seeing Mr. Nov Keo is a committed farmer, in 2014, Natural Agriculture Village Shop also supported him with a nethouse of 239 m-2, and provided him a loan to build a big nethouse (12mx40m), enabling him to produce large and regular quantity of vegetables to supply to the shop. He grows different kinds of vegetables of Brassica oleracea including cauliflower, Chinese kale (Brassica alboglabra), kale, green mustard (Brassica Junces L.), choy sum (Brassica Chinensis), bok choy (Brassica rapa chinensis). On average, he supplies about 500kg of vegetables to shop every month, and the monthly net profit is about 470USD (depreciation cost of equipment included). He only uses composted cattle manure (basal application) and liquid compost. To make liquid compost in a cubic meter jar, he mixes 1 kg of bat manure, 3 kg of cattle manure, 21 kg of ripen papaya, 20-40 kg of Eupatorium odoratum L., and rice water (water obtained after the rinsing of white rice for cooking). The mixed solution is left for two weeks for the decomposition before it can be used to water the vegetables. The liquid compost can be used two or three times for a cycle of vegetable. Mr. Nov Keo sees several advantages by using nethouse, economically, socially and environmentally. With nethouse, he can grow different vegetables, enabling him to get higher and regular income because he can harvest weekly and sell vegetables at a higher price than conventionally produced vegetables. 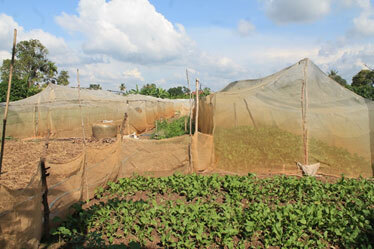 It is worth noted that most farmers in this area grow only one vegetable on the field at a time. Before he used the nethouse, Mr. Keo was also growing only one vegetable at a time, harvesting his entire field and selling it all to a collector. The increase in crop diversity has many agro-ecological benefits, especially in managing/reducing the impact of pest and disease incidents. The production cost is also reduced because he does not need to spray chemical pesticide any longer. In addition, his health is not harmed by chemical pesticide use. According to Mr. Nov Keo, difficulty in weeding is a disadvantage of using the nethouse as there is less ventilation inside the nethouse. Through his experience, the roof of nethouse should be gable, not flat. This is because with flat roof there is a risk of excess water ponding on the roof in the event of subsequent heavy rainfall, causing strong runoff water and endangers the vegetables.